Did you know the best family-friendly evening party in Myrtle Beach happens nightly—and it’s totally free? If not, then you haven’t heard about the Myrtle Beach Hot Summer Nights on the boardwalk, which takes place just a few minutes walk from Holiday Inn at the Pavilion. During the day, the boardwalk has all the shopping, people watching and dining you could want, along with great views and ocean breezes. But at night, the boardwalk and nearby Plyler Park and really heats up with free events every night during the summer with Hot Summer Nights, which run every night from June 2 to September 29. 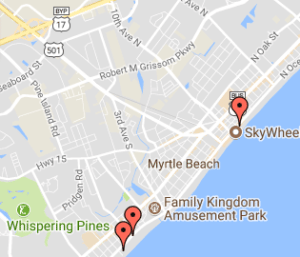 The action takes place at Plyler Park, part of the boardwalk on the corner of Ocean Boulevard and Mr. Joe White Avenue. • Look for a whole lotta shakin’ from a roving Elvis impersonator performing in Plyler Park and even down to 9th Ave.
• Monday nights June through September, the boardwalk will be outfitted for a kids’ carnival in the park replete with bouncy inflatables, games, street performers and face painting. • Live music, featuring both local and touring bands from the region, will light up the stage Tuesday, Thursday and Saturday nights from 7 to 11 p.m. The schedule hasn’t been set yet, but last year’s lineup included reggae, country rock and beach music bands. • Wednesday nights the sky will explode with the best fireworks show at the beach off the 2nd Avenue Pier, and look for live music on the 9th Avenue stage from 7 to 11 p.m. Expect extra special fireworks extravaganzas for July 4 and Labor Day. • Friday nights from 7 to 11 p.m., visitors can enjoy the jaunty tunes from a strolling Dixieland trio along the boardwalk. The Myrtle Beach Oceanfront Boardwalk and Promenade, while three years old, is a delightfully old-school beach experience, and it’s one of the top-ranked boardwalks in the U.S. The northern section is a classic wooden boardwalk, and along with the middle, carnival-like commercial section and the southern park-like section, the boardwalk traverses nearly 1.5 miles of beach from the 2nd Avenue to 14th Avenue piers. Hot Summer Nights on the boardwalk has become one of the best-kept secrets for free family fun in Myrtle Beach, but the secret is starting to get out! Make your plans to visit Holiday Inn at the Pavilion in Myrtle Beach now, and be sure to add Hot Summer Nights to your agenda. As Myrtle Beach’s Oceanfront Boardwalk enters its third full year, it continues to be a favorite destination with vacationers and locals alike. In fact, National Geographic Travel named the Myrtle Beach boardwalk the third best boardwalk in the nation, behind only Atlantic City and Coney Island! “The launch of the Myrtle Beach Oceanfront Boardwalk & Promenade in summer 2010 breathed new life into the Grand Strand beachfront. From souvenir shops and arcades to an oceanfront park near the 2nd Avenue Pier, the 1.2 mile walkway is now the town’s hub of activity.” We couldn’t agree more! The boardwalk runs up the beach from the 2nd Avenue to the 14th Avenue piers. There are three distinct areas of boardwalk, each with a slightly different feel, so there’s plenty of variety to be enjoyed. The north end of the boardwalk from Pier 15 to Plyler Park is the classic, old-school raised wooden deck boardwalk. This is where you can come enjoy free entertainment with Hot Summer Nights, from live music to Elvis impersonators and even a kids’ carnival on Monday nights and free fireworks on Wednesdays and holidays during the summer. Hot Summer Nights run every night from June through September and on most weekend nights in the spring and summer. The middle section of the boardwalk from Plyler Park to the former site of the Myrtle Beach Pavilion has a carnival-like atmosphere and is filled with shopping, restaurants and bars, plus gift shops where you can load up on all the souvenirs you promised your friends back home. The southern section is the promenade, and it runs from the pavilion down to the 2nd Avenue Pier. This is where you’ll find a more park-like atmosphere, with beautiful landscaping and benches to sit and soak up the gorgeous scenery. Of course, all of this is located just steps from Holiday Inn at the Pavilion, which makes it easy to enjoy this don’t-miss destination the next time you visit Myrtle Beach.